The other weekend I cycled down to Clapham for a long overdue catch-up with my original "brunch buddy". She used to live just down the road from me in Angel, but since she upped sticks and moved South London, our brunching has become (tragically) less frequent, and it was lovely to get together again. We're both big fans of Bread Etcetera (unlimited bread to toast at your table, what more could you want?) but unfortunately 11.30am on a Saturday is not the best time to visit, and the queue was already snaking out of the door when we got there. 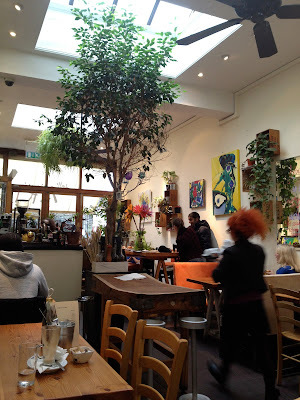 Instead, we crossed the road to another great brunch spot - the Osteria Dell'Arte. Bright and airy inside, with high ceilings, a glass roof, and - impressively - a large tree, you can almost imagine you're eating outside (although without the icy temperatures and intermittent drizzle of a British winter). White walls and colourful arty accents complete the fresh, zesty vibe. 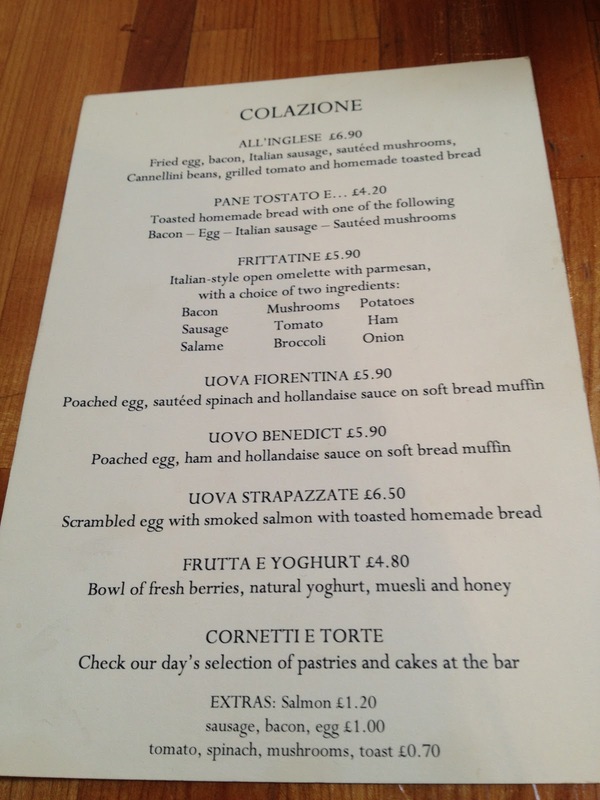 The breakfast menu - despite the Italian make-over - offers a fairly classic selection of brunch-time favourites, from smoked salmon scrambled eggs to omelette. I went for the All'Inglese (aka the full English), while my friend opted for the Uovo Benedict. A neat stack of bacon, mushrooms, grilled tomato, sausage and beans were topped with a perfectly fried egg: everything was good, but the spicy Italian sausage and the home-made baked beans were particularly delicious. The large squeezy bottle of Sainsbury's own brand ketchup was a homely touch - no fancy home-made ketchup here! - and despite being a total Heinz snob (if you can actually call someone who smothers everything in ketchup a snob) it was actually pretty tasty! My friend's Eggs Benedict was also good, with plenty of ham and a generous drizzling of golden hollandaise. Along with our food we had couple of teas (and a nice long chat) before going for a wander around Clapham (which ended up with us both accidentally buying uneccesary accessories from a cute little boutique around the corner...oops!). To conclude, Osteria Dell'Arte is a lovely spot: next time you're shivering away in the queue for Bread Etcetera, maybe you should pop across the road instead!